Often described as the eighth Wonder of the World, the massive, underground army made from fired clay evokes both awe and curiosity. Who was this powerful Emperor of the Qin Dynasty who needed these warriors to guard him in the afterlife? How were nearly 8,000 figures made on such a vast scale so long ago? 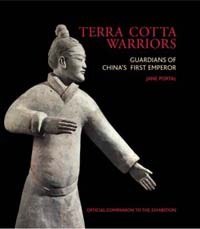 This lovely little book, based on the latest research, brings the terra cotta warriors to life in 52 astonishing images. Like the millions of visitors to the on-site museum who see the figures in person, readers will marvel at the cavalry, archers, and infantry; lowly foot soldiers and high-ranking officers; figures of varying ages, with different hairstyles and unique facial expressions, seemingly representing many ethnic groups in China.